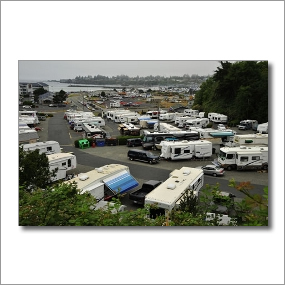 Driftwood RV Park is located in the beautiful port of Brookings on the pristine southern Oregon Coast just 6 miles north of the Californian border. Located just a 5 minute walk from the beach Driftwood RV is close to the many galleries, craft stores, antique stores and speciality stores that Brookings has to offer. For you fishermen there's ocean fishing for Chinook Salmon, Rockfish and Halibut and fresh water fishing for Steelhead on the nearbyChetco River. For you golfers, there's a Championship 18-hole course within a short 4-mile drive. All Sites have Full Hook-Up with Free Cable-TV and Picnic Tables, 50-amp Pull-Thrus w/ Instant Phone, Free Wi-Fi Internet Connection & Great Rates! Sheltered, forested campsites for RV's, tents, and even yurts. Semi private sites available. Playground available in campground. Flush facilities and hot showers provided. Good selection of Yurts available but they do get booked early in the busy season. A pleasant quarter mile walk along a wooded trail gets you to Harris Beach, complete with its impressive rock formations and tidal pools. There is a picnic area at the beach with flush facilities and potable water. Just a couple of miles from Brookings, all services in walking distance. Nearby is a golf course, redwoods, Kalmiopsis Wilderness, marina, coastal trails and rivers. Harris Beach State Park is located on Hwy 101 at the north end of Brookings city limits in Curry County on the Oregon south coast. Beautiful sheltered campsite beside the Chetco River and Redwood Grove. Accessible flush facilities and hot showers provided in campground. Private sites with tree shade. Picnic area located next to river with flush facilities and potable water. Close to ocean beaches at Brookings, redwoods, Kalmiopsis wilderness, marina, forest trails and Chetco River. Loeb State Park is located 9 miles east of Brookings on the North Bank Chetco River Road off Highway 101 at the south end of Brookings city limits. The U.S. Forest Servicer operates a number of fee and no fee sites in the area. Some of the more popular campgrounds are Little Redwood, Winchuck, Packer's Cabin, Ludlum House and several fire lookouts. Chetco Ranger Station, 555 Fifth Street, Brookings. 541-469-2133.